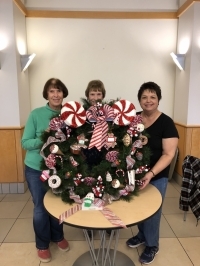 Herb Guild members Barb Armstrong, June Zweidinger and Fran Wilhelm with the club's wreath. The Herb Guild Garden Club has decorated a wreath for the GLOW display at the Cleveland Botanical Garden in University Circle. Every year area clubs are invited to decorate Christmas trees or wreaths at the botanical garden to exhibit to the public during the holiday season. 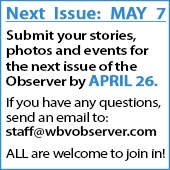 This year's GLOW theme is "Remember When?" which is a nod to the nostalgic days of Cleveland. The Herb Guild wreath is decorated with candies and sweets from the past and is titled, "How Sweet it is." Visitors can see the club's wreath, as well as other clubs' decorations, from now until Jan. 5, 2019. Visit cbgarden.org for hours, admission rates and tickets. Besides the trees, there will be a gingerbread house display and activities for children. The museum has a cafeteria where you can grab some food and a gift shop to get last-minute gifts. This is a fun, family activity sure to bring some holiday cheer to everyone.